The Lufkin Speedwinder measuring tape has a unique hub less winding design for faster rewinds than traditional long tapes. The 100 ft. heavy duty yellow clad steel blade is protected by an abrasion resistant coating. The signature Hi-Viz orange case can be easily located on just about any job site. Tbook.com crawls the web to find the best prices and availability on Tape Measures and related Tools and Hardware products like Lufkin 3/8 inch x 100 ft. 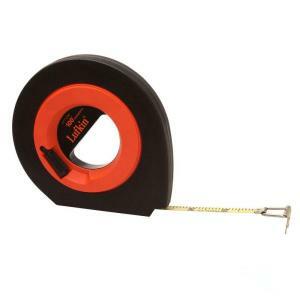 Engineers Speedwinder Steel Long Tape Measure. For this page, related items include products we find that match the following keywords: "Tape Measure" at our vendor partner Home Depot. Lufkin 3/8 inch x 100 ft. Engineers Speedwinder Steel Long Tape Measure is one of 111 Tape Measures and related products listed in the Tools and Hardware section of Tbook.com If you have any questions on this product, please give us a call at 734-971-1210 during the hours of 9am - 5pm EST for assistance. Thank you for shopping at Tbook.com, the Internet Department Store!